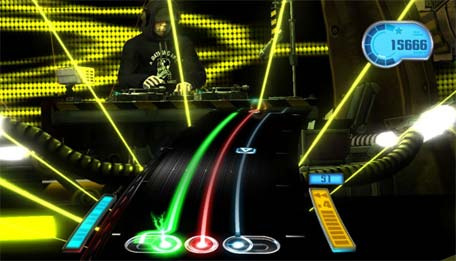 Here's Your First DJ Hero Screenshot. Wii Music's nursery rhymes aside, unless you like "rock" music (and all the subsequent genres attached to it) you're essentially boned. Here at PushSquare we're happy to lay claim to the fact that the closest to "rock" our library will ever extend is Fleetwood Mac and Duran Duran. So, hearing about DJ Hero is a breath of fresh air. Naturally the backlash has already began: game has been labelled "rubbish" by forum-goers worldwide because said "commenters" simply can't comprehend the fact that there is music beyond ZZ Top that people enjoy. I.e. here at PushSquare we think the mix from the subsequent trailer is, well, actually really awesome. Sadly the trailer features no gameplay (see above screenshot) but the "Hollaback Girl"/"Give It To Me Baby" mash-up is worth watching the trailer for.